1st: Frazier struck out swinging. 3rd: Frazier grounded out to second. 6th: Frazier grounded out to third. 8th: Frazier walked, Moran to second. 9th: Frazier popped out to shortstop. 1st: Marte struck out swinging. 4th: Marte struck out looking. 6th: Marte grounded out to second. 8th: Marte flied out to right. 9th: Marte doubled to right, Newman and Kramer scored. 1st: Osuna homered to left (407 feet). 4th: Osuna struck out swinging. 6th: Osuna singled to right. 9th: Bell grounded out to shortstop. 1st: Díaz grounded out to first. 4th: Díaz flied out to right. 6th: Díaz struck out swinging. 8th: Díaz singled to right, Moran and Frazier scored, Bell to third, Díaz to second on throwing error by shortstop Báez. 10th: Díaz singled to right. 2nd: Dickerson lined out to left. 5th: Dickerson homered to center (409 feet). 7th: Dickerson lined out to center. 10th: Dickerson flied out to right. 2nd: Reyes grounded out to third. 5th: Reyes flied out to right. 7th: Reyes grounded out to second. 8th: Reyes grounded out to third. 10th: Reyes grounded into double play, shortstop to second to first, Díaz out at second. 2nd: Luplow flied out to right. 5th: Luplow tripled to left. 7th: Luplow struck out swinging. 9th: Luplow popped out to second. 3rd: Newman singled to right. 5th: Newman grounded into fielder's choice to pitcher, Luplow out at third. 8th: Newman struck out swinging. 9th: Newman singled to center. 3rd: Nova bunted into double play, first to shortstop to second, Newman out at second. 5th: Lavarnway lined out to right. 9th: Cervelli doubled to deep right center, Newman to third. 1st: Murphy lined out to left. 3rd: Murphy reached on infield single to shortstop, Bote to second. 4th: Murphy singled to left. 6th: Murphy grounded out to first. 8th: Murphy grounded out to shortstop. 1st: Báez struck out swinging. 3rd: Báez grounded into fielder's choice to second, Bote to third, Murphy safe at second on error by second baseman Frazier. 4th: Báez singled to left, Murphy scored. 6th: Báez grounded out to shortstop. 9th: Báez struck out swinging. 1st: Rizzo singled to center. 3rd: Rizzo hit sacrifice fly to center, Bote scored, Murphy to third, Báez to second. 4th: Rizzo reached on infield single to second, Báez to second. 6th: Rizzo grounded out to shortstop. 9th: Rizzo fouled out to catcher. 1st: Heyward homered to left (374 feet), Rizzo scored. 3rd: Heyward popped out to shortstop. 4th: Heyward singled to right center, Báez scored, Rizzo thrown out at third. 7th: Heyward popped out to third. 9th: Heyward grounded out to pitcher. 1st: Happ struck out swinging. 5th: Happ reached on infield single to shortstop. 7th: Happ singled to right. 2nd: Schwarber grounded out to shortstop. 3rd: Schwarber walked, Murphy scored, Báez to third, Happ to second. 5th: Schwarber singled to center, Happ to second. 7th: Happ safe at second on throwing error by pitcher Feliz. 7th: Schwarber struck out swinging. 10th: Freeman sacrificed to first, Gore to second. 2nd: Caratini lined out to center. 3rd: Caratini grounded out to first. 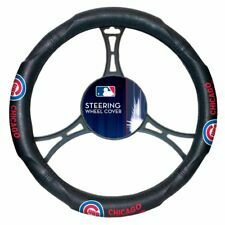 5th: Caratini sacrificed to third, Happ to third, Schwarber to second. 7th: Caratini lined out to second. 10th: Caratini grounded out to first, Gore to third. 2nd: Quintana struck out swinging. 4th: Quintana grounded out to third. 8th: Almora Jr. grounded out to pitcher. 10th: Almora Jr. singled to left, Gore scored. 3rd: Bote singled to right. 4th: Bote grounded out to second. 5th: Bote grounded into double play, second to first, La Stella out at second. 8th: Bote struck out swinging. Shortly after their playoff spot was assured, the Chicago Cubs beat the Pittsburgh Pirates 7-6 Wednesday night when Albert Almora Jr. hit a game-ending single with two outs in the 10th inning. 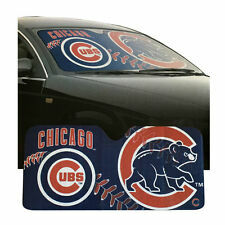 New MLB Chicago Cubs Car Truck Windshield Folding SunShade Large Size 27.5"x58"